1. Lady Jeanne Louise Campbell (b. 10 Dec 1928; d. 2007), married: (1) 1962 (div. 1963) as his third wife Norman Mailer, the American novelist (b. 31 Jan 1923; d. 10 Nov 2007), son of Isaac Barnett Mailer, and (2) 2 Mar 1964 John Sergeant Cram, of Hopewell House, Irish Town, Jamaica, son of Henry Sergeant Cram, of Foot Point Plantation, Bluffton, USA, and had issue by both husbands. Married: (2) 23 Nov 1935 (div 1951) Louise Hollingsworth Morris Vanneck (former wife of Hon Andrew Nicholas Armstrong Vanneck MC; d. 10 Feb 1970), only dau. of Henry Clews, of Chateau La Napoule, Alpes Maritime, France. 2. 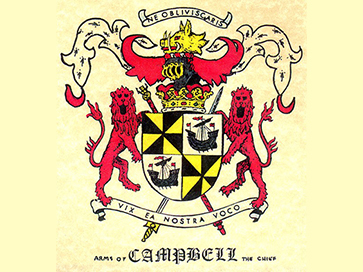 Lord Colin Ivar Campbell (b. 14 May 1946), married: 23 Mar 1974 (div. 1975) Georgia Ariana Ziadie, dau. of Michael Ziadie, of Jamaica. No issue. Married: (3) 22 Mar 1951 (div 1963) Margaret Sweeny (former wife of Charles Sweeny; d. 1993), only dau. of George Hay Whigham, of London. No issue. Married: (4) 15 Jun 1963 Mathilda Coster Heller (former wife of Prof Clemens Heller, of Paris; d. 6 Jun 1997), dau. of Stanley Mortimer, of Lichfield, Connecticut.